Here's a delicious, crowd-pleasing recipe that's perfect to showcase the mellow flavors of fresh blueberries, but you can swap any fruit cup-for-cup or a mix of favorites. It makes a great dessert for casual gatherings or a lovely addition to a brunch menu. Lightly grease a 13- x 9-inch pan. Spread 1/2 the bread cubes over the bottom of the pan. Sprinkle evenly with 2 cups blueberries. Top with remaining bread cubes. Whisk together eggs, milk, butter, 1/2 C maple syrup, cinnamon, and vanilla. Slowly pour over bread cubes. Cover and chill 8 hours to allow cubes to absorb mixture. Bake, covered, at 350° for 30 minutes. Uncover and bake 30 more minutes or until lightly browned and set. Let stand 5 minutes. When the pudding is removed from the oven, stir together 1 cup blueberries and blueberry preserves in a saucepan over low heat until warmed. Pour blueberry mixture over bread pudding. 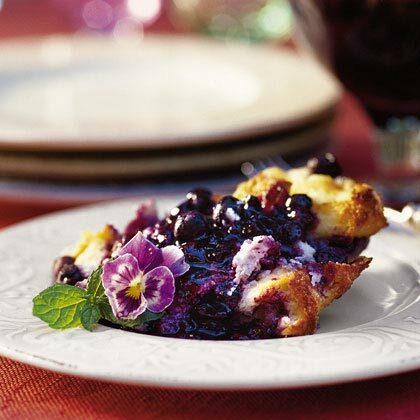 Serve warm or at room temperature, topped with remaining fresh blueberries and whipped cream.